TROY, TX — The fast growth in Central Texas has lots of school districts taking a hard look at their schools, class size and capacity. 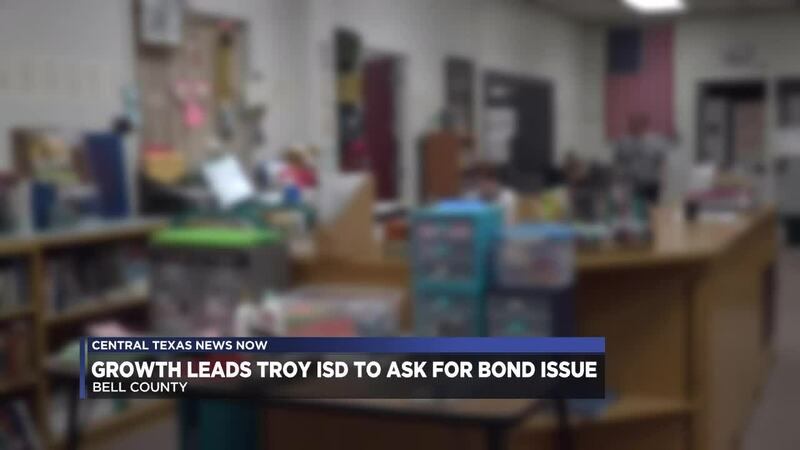 The Troy ISD school board will ask voters to approve new taxes to pay for new classrooms and security improvements in the next couple weeks. Every time Jana Letbetter walks through Troy, she sees something different. "It's happening behind us here, it's happening over there, I love it. There's more kids, there's more families there's growth and we have great churches here, great schools," Letbetter explained. But growth has put pressure on those schools. "We're watching growth happen around us here, seeing subdivisions come in, and the board wisely started to think ahead, what do we need to be ready," said Troy ISD Superintendent Neil Jeter. The school board is asking for a $18.25 million bond issue. It will buy secure entries at two schools, new classrooms at three campuses, an updated library for the high school, along with several other improvements that will give students and teachers room to grow, along with the town. Superintendent Neil Jeter said not a dime will get wasted. "We're gonna stretch it as far as we can,” Jeter said. He hopes voters will approve the bond issue, which will add a little more than $15 a year in taxes on a home worth $100,000. "So, we feel like the plans that we're proposing now, will cover us for about 10 years,” said Jeter. Letbetter says if the improvements will help keep class sizes down, she'll support it. "I think class size is a major thing. I think in order to keep our community as tight-knit as we are, smaller class sizes are valuable," Letbetter said. The election takes place at the district office on May 4. Early voting runs from April 22-30.